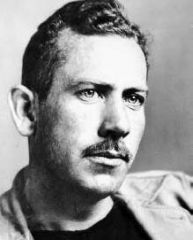 John Steinbeck was born in Salinas, in Northern California, in 1902. His roots inspired and connected him to frequent subjects like farmers, ranchers, laborers, and melting pots of American and Latin-Chicano culture. The last original work published during his life, Travels With Charley, about his sojourn around the country with the family dog, is a fitting swan song for the author, whose tireless curiosity led him to write about pirates and war trauma, about marine biology and Bob Hope. Below, we’ve collected several facts about this treasured American writer. "Present-day kings are not very inspiring ... and the only heroes left are the scientists and the poor. The scientists are largely hidden away, but the poor are still out in the open, and when they make a struggle it is an heroic struggle with starvation, death or imprisonment the penalty if they lose. And since our race admires gallantry, the writer will deal with it where he finds it. He finds it in the struggling poor now." “A writer must rearrange reality so it will seem reasonably real to the reader,” Steinbeck writes in his manuscript for Travels With Charley. In this regard, he was a man of his word. 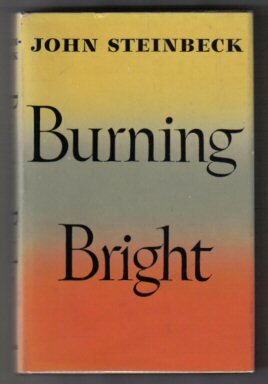 His consistent description of the trip as sustained by humble and threadbare accommodations is undermined by his staying at a large suite in St. Francis Hotel in San Francisco and the country home of Adlai Stevenson. Yet his most glaring fabrication concerns the premise of the book. A story of a lone man and his dog trekking across the country is contradicted by the trip itself. In fact, Steinbeck’s wife Elaine attended much of the trip with him. At the urging of an editor at Viking, Elaine was scrapped, and replaced by a dog, who now became the story’s second-biggest character. Steinbeck will always be remembered for holding a place in his heart for the proletariat and working people, but his political and social opinions extended naturally farther. One trend he was especially worried about was the particular way American parents, with all their tenacious optimism, were fulfilling the poet Philip Larkin’s wisdom (“They f*ck you up, your mum and dad. They may not mean to, but they do.”). Laziness, sloppiness, indiscipline, selfishness, and general piggery, which are the natural talents of children and were once slapped out of them, if they lived, now became either crimes of the parents or sickness in the children, who would far rather be sick than disciplined. The complexities extend further, even to paradox, with the emphasis on child-rearing actually inhibiting children’s maturation. “The American approach to the young has extended adolescence far into the future, so that very many Americans have never and can never become adults,” Steinbeck concluded. Steinbeck wrote to a friend of Salinas in 1933 that, “I think I would like to write the story of this whole valley, of all the little towns and all the farms and ranches in the wilder hills.” Salinas was less enthusiastic, burning copies of The Grapes of Wrath in 1939, in one of many gestures that the growers and farmers of the town used to display their resentment. Steinbeck even refused to allow a school to be named after him in Salinas, fearing that it would provide ample excuse for natives to curse his name. Now, the author’s childhood home is a restaurant and attraction, and now the Salinas' National Steinbeck Center hosts a three-day Steinbeck festival that has been running for over 36 years. The bold, it seems, often require some warming up to.